Forum Index > Off-topic Talk > 11th century Norman arms and battle tactics. Posted: Tue 23 Nov, 2010 5:55 am Post subject: 11th century Norman arms and battle tactics. I've been given the oppurtunity to do a project on a topic of my choosing so, naturally, I chose military history. I will be doing a study of the Roman and Norman military, the main linking topic being the invaders of Britain (I will also be looking at the Anglo-Saxons and Britons). I will also include my own illustrations. For the Romans I will study the battle of Caer Caradoc (51 CE), and for the Normans I will study the Battle of Hastings. Whilst reading C. Gravett and D. Nicolle's wonderful book "The Normans: Warrior Knights and their Castles" I was provoked by a series of questions concerning 11th Century Norman arms and battle tactics. I) The Norman sword , type X i believe?- How effective was this sword in battle? How would it have been used in the tightly compacted formations of the time? II) On the Bayeux tapestry we see Norman miles wearing mail hauberks. On these hauberks there are what appear to be squares lined with leather. What could these be? I think one of the most possible ideas could be that they are supposed to portray the soldiers' neck-guards hanging loose? I have also heard theories that these may be pockets with a plate fitted inside to protect the torso. III) Had the Normans developed the technique of the couched lance at this time? I have seen in portrayed in several pieces from later eras, yet here they appear to either by throwing them or thrusting them underarm. IV) How would the army's units have been used in battle? Would they have advanced in these seperate units much like the Romans did? In most medieval battles portrayed on TV and on films they just seem to charge in an un-organised mass of men seeking individual glory. I think it may have been different. V) How well would the men in these units know each other? Was their training formalised? VI) I know that the Norman cavalry were split into a bataille and conroi - was this the same with infantry too? VII) What sort of formation would the Norman infantry have fought in at Hastings in 1066 - a shieldwall like the Saxons? VIII) Would Duke William have actually fought himself at the battle? I have read that the quality of Norman leadership was very high. Was their a formalised hierarchy in the comman system? Sorry about the number of questions, but these questions have been bugging me for a while. I could perhaps organise them into different topics? I'll soon be doing some illustrations of Norman soldiers. I will describe each type of soldier and their role in the battle whcih will come with a drawing of them. Would it be okay to post them on here so I can corrected by the experts? The type X and XIs used in the 11th c are broad bladed cutters. They perform very well against soft targets, but are not optimized for fighting armoured foes. Indeed, neither are the XI and XII's in the centuries to follow, though they gain a more slender profile. This would suggest that armour piercing capability was not a great concern with the warriors of the time, as their cut oriented swords where deemed sufficient. In turn, this could sugest that the amount of armour in a generic army was lower than the Bayoux tapestry would suggest. This was a era of large shields, and as such the targets for sword strikes would be the head or legs. If the opponent wore a helmet, the more lightly armoured sides of the head would be the prime target. The adoption of longer, strike oriented swords (XI and XII) could be an adoption to this. It is quite possible to land hard blows even in tight formation (The amount of swing needed to deliver a forcefull sword blow is often exagerated. ), though the spear is the primary weapon in a formation fight; A 13th c Norwegian source (We where slow to abandon shieldwall warfare...) cautions the reader from throwing his last spear, as "the spear is worth two swords in the Fylking (formation)"
Posted: Tue 23 Nov, 2010 9:36 am Post subject: Re: 11th century Norman arms and battle tactics. Here's what I know. Hope it helps. I think there's a section of the tapestry that shows some cavalrymen couching their lances. But don't quote me on that. From what I've read the cavalry was waiting for the opprotune moment, the missile troops seem to have kept a fairly static position and the infantry advanced seperately with missile troops providing support. When the Norman foot got hung up the cavalry advanced to rescue them. The accounts show very organized and disiplined conduct on both sides (It was only later that the saxons started breaking ranks). Depends on what you mean by formalized, the training was not as scientific as today but there have always been Drill Sergeants. The Kings Mirror (13th century source) very much emphazises drills and training with all kinds of weapons. Throughout the middle ages military commanders were avid readers of Vegetius who also emphazised structured training and drills. Yes, the Duke was very involved in the action, he's mentioned losing a horse during the fighting and killing one of Harold's brothers (For killing his horse) and at one point he had to remove his helm and ride back and forth across his lines to show his men he hadn't been killed. 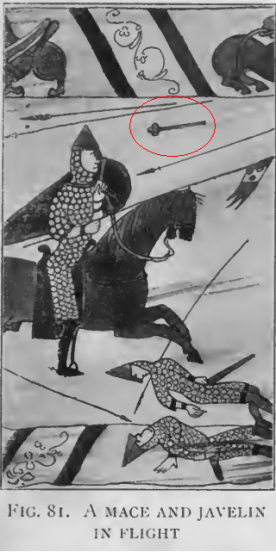 A 13th c Norwegian source (We where slow to abandon shieldwall warfare...) cautions the reader from throwing his last spear, as "the spear is worth two swords in the Fylking (formation)"
Do you have a cite for this quote? Id love to read it. "If you are fighting on foot in a land battle and are placed at the point of a wedge-shaped column, it is very important to watch the closed shield line in the first onset, lest it become disarranged or broken. Take heed never to bind the front edge of your shield under that of another. You must also be specially careful, when in the battle line, never to throw your spear, unless you have two, for in battle array on land one spear is more effective than two swords." Posted: Tue 23 Nov, 2010 4:44 pm Post subject: Re: 11th century Norman arms and battle tactics. From my, admittedly limited, knowledge of military history, I would say that swords were not much used in formation at this time. Spears were the primary offensive weapon, and swords were mainly used when formation had been broken e.g. during a route. Wace's Roman de Rou is an entertaining read, "The Normans in their Histories" Albu, "The Medieval Horse" Hyland and "William I" Ashley are all good reads and will give you some solid material to work with. Whilst swords were commonly carried (especially by the upper/landholding classes) the primary weapon in use on the battlefield would have been the spear. This may well have been thrown as well as used overhand or tucked into the body. I would suggest neck-guards. The interpretation of these objects goes forwards and backwards, older sources will suggest they are something else. I don;t hold with the idea that they are chest re-enforcement as it's frankly unnecessary, the small area of the body it might cover would be infrequently struck (defended by the shield or the weapon arm). Protection of the neck & face would however be critical as even a minor impact would be potentially fatal. Depends to an extent on your definition of couching. Typically illustrations show the spear not being held at full extent and of a similar size to that used by infantry (where shown together), so this would be different to the classic couched lance. There was clearly some organisation probably in groups associated around chief landowners and his tenants owing military service. That said should we take the accounts of tancred at hastings at face value there was definitely a lot of scope for individual heroics that the typical Centurion of the roman army would have had little time for. Not aware of any references on 'formal' training, however any chap who could afford a horse and mail had leisure time to become effective in a group. If we assume the practices of 100 years later are reflective of this early norman period then the idea of being sent to another family to complete your military training shows some degree of trainign prior to this was commonplace. Probably, but the infantry was often hired in (as it was for hastings) and generally used as a base that cavalry could return to. It is not until the landowning classes start to dismount during the angevin period that they become a significant portion of the 'norman' military machine. Yes most probably but the infantry get very little 'camera time' in any of the contemporary(ish) accounts so we really don;t knwo what they did for the most part. Most definateley, he lost 3 horses and towards the end of the battle is described to have shown his face to proove he was alive. Hierarchy would have filtered through the social/landowning order, so the great magnates of the time would have help positions of military responsibility. Yes, I've read that the Normans relied a lot on mercenaries during the conquest. But where would they have come from? I think it was mentioned that he had some from Flanders, Brittany, France and even parts of Italy. These mercenaries seemed to have had an influence on Norman tactics also. The much debated withdrawal that drew out the English is said to have been a tactic often used by the soldiers of Brittany, and it was this that eventually caught the Anglo-Saxons out. In armies that used mercenaries it seems that each culture incorporated into the army has a specific purpose on the battlefield. A good example would be the Balaeric slingers used by the Romans, expert skirmishers, Batavians used for crossing rivers, Gauls for cavalry, Germans as close-quaters clubmen and spearmen. Would this have been the same in the Norman army? Also, by formalised training I mean the soldiers fighting and drilling in a designated area with the men in their unit, getting advised by experts on what to do and how to do it, having inspections etc. I can't really imagine a medieval army doing this, really, but I could be wrong. magnates of the time would have help positions of military responsibility. forth across his lines to show his men he hadn't been killed. Wow, William must have been a really impressive leader. This also shows that there must have been a relatively complex chain of command for the soldiers to know what to do and when to withdraw etc. with their Duke fighting in the midst of the battle. But I suppose that depends upon how you interpret the retreats. Indeed, the beggining of the retreat where he had to lift his helm must have been genuine, but I still think that the withdrawl on William's left flank by the Bretons was planned. Does anyone know where I can find some literary accounts (from the medieval era) of the battle online? keep in mind that the bayoux tapestry and all the other primary sources are extremely political. The victor tells the tale, and in this case the message sent was of great importance, not only in England, but in France. As a french vassal, William was defintely out on a limb elevating himself to king in another country. At the same time, it was a enormous boost, as long as he could get away with it. This can be clearly demonstrated by the very favourable marriages his line entered into, granting his decendants controll of large parts of France. Thus, glorifying his victory and his own participance would be very much in his interest. For instance, the Battle of Stamford Bridge is omitted entirely from the bayoux tapestry. The focus on cavalry could also be seen as a result of a feudal political organization. Rather than rely on massed infantry, raised by directly levying the peasantry, the feudal system focused on a small, mobile elite, which could excert controll over an area independent of the king's popularity with the people. Thus because all the aristocrats fight on horseback themselves, the infantry receives little attention. It is no coincidence that more or less all depictions of warriors and battle from 1000AD on show a mounted knight. Perhaps one place to look is at the bottom of the Bayeux tapestry where (presumably) the lower classes are depicted. During Hastings we see archers, and infantry (though I'm not certain which side they're supposed to be on) looting the dead. But I think it is correct to be wary when looking at the tapestry. We can compare this with Trajan's column. Yes, it does tell us a lot of how the Roman army operated, but it is not to be relied upon, not for equipment or what it depicts. Another interesting thesis (though I myself am quite skeptical about it) made by Wolfgang Grape is that the designer of the Bayeux tapestry was a first-hand observer of the battle. 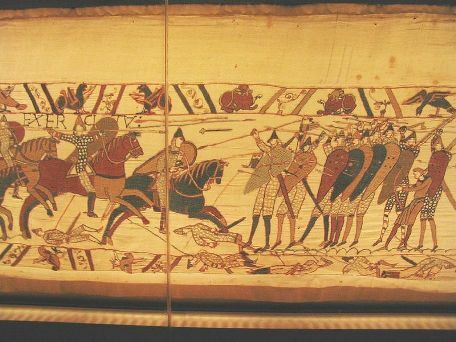 The Bayeux Tapestry was probably commissioned by Bishop Odo, possiblystitched by English embroiderers, but we have no idea who drew the cartoon (assuming there was one) or was responsible or it's design. It is of course possible they were at Hastings, but we don't know for sure. There are a lot of books on the subject, the wikipedia article contains many of the commonly known & a search on amazon will give you a couple of dozen more. Lots of conflicting expert views as the article on wikipedia summarises. Both infantry and cavalry seem ready to launch. We can see throw mace and spears. Someone here was undisciplined... ...at least in this age. The passage should not be interpreted as "Don't throw spears", but rather "Bring extras!" the trajectory of the mace is a bit strange , too perfect ... miracles of embroidery. The Romans liked to imagine that each ethnic group had its own national weapons, and the way in which they organized some of the auxiliary elements of their army reflects this. Recently, however, there has been some good work in both archeology and history that challenges the idea that actual ethnic groups used different weapons based on their ethnicity. There are, of course, large-scale regional variations, but if grave finds are any indication, these variations do not allow themselves to be conveniently broken down into regionally homogenous groups (you won't find the Alemani using only swords and seaxes, and the Franks only using spears and axes, as has been previously argued by many 19th and early 20th c. archeologists). This is to say, if different ethnic groups within the Roman army used only specific sorts of weapons, this is more likely due to the expectations of the Romans organizing the army units, and not due to the regional or ethnic preference of these soldiers. How many other examples of this weapon are there on the Tapestry - either being held or being thrown? Either being held or being thrown? Apart, the thrown that you see ... mmm hard to say. In all cases, there seems to be "formation in waiting" , perhaps wait for an order? This could mean that the rules "in general" was not an optional. Perhaps, they are far from the ancient impulse and personal glory. I did not know this. I always thought of a circular motion. the mace seems to hit straight to the head. The knight is galloping, maybe great skill, or maybe a little help of embroidery.